Where are you when it comes to Pro-life? Pro-life advocates, your efforts to care for the victims of the tragic choice of abortion are deeply appreciated and invaluable. I challenge you to consider another approach to combat this plague on our families and nation. 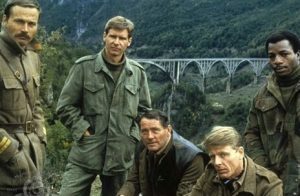 Many years ago, before Star Wars and Indiana Jones, Harrison Ford starred in a World War 2 film called Force 10 from Navarone. It was a suspenseful drama about a group of soldiers sent on a mission to destroy a bridge that spanned over treacherous terrain. It separated the German army’s heavy armor division from invading the Yugoslavian mountains. This bridge was vital in the success of the enemy to conquer the friendly forces. Once the embattled demolition unit was able to observe the bridge, the soldiers realized that the structure was just too heavily fortified and guarded. Destroying the structure was impossible with the limited explosives and the few forces that they had. Harrison Ford’s feeling of hopelessness was answered by Benard Shaw’s question to the demolition expert, “Cooper what would happen if millions of gallons of water were to suddenly hit the support structures of that bridge?” Cooper thought for a moment and said that it would cause the bridge to come crashing down. Bernard Shaw explained to those milling about that he observed a hydroelectric dam a few miles upstream from the bridge and it was not heavily guarded. Cooper looked at everyone and said, “Why are we sitting around here for, there is work to be done!” To make a long story short, Force 10 detonated the small cache of explosives that they had and a crack was made in the dam, then another, and another. Soon larger pieces of concrete began falling from the structure. The dam once compromised, could not hold the water and with a big dramatic effect came crashing down emptying the reservoir of millions of gallons of water. Downstream, as the enemy tried to move over the bridge they were at first curious to see the rising water, then panic set in as the sound and sight of the roaring wall of water overwhelmed the bridge. The bridge came crashing down immediately followed by a celebration by those who were now safe from the hand of the enemy. As I think about the success of that operation I am amazed about all the pieces that had to come together to make the destruction of that bridge a reality. The brave allied forces at the bridge needed to courageously defend their side of the structure less they be overrun with enemy forces and forced to surrender. The demolition team needed to be supplied with explosives and enough ammunition to defend themselves. They also needed to be fed, sheltered and hidden in the woods and countryside until it was time to be transported to their target. It took the dedication, courage, and wisdom of others to make this operation a success. As I look at this film I see many similarities that are critical in the protection of the preborn. So, where are you in this battle called Pro-life. Are you at the bridge on the front lines holding back the enemy in the media and courtrooms? If you are, thank you for your service. Are you at a resource pregnancy center giving food, supplies,and hope to the vulnerable? If you are, thank you for your passion. Are you sheltering the broken hearted and empowering those that have been wounded by abortion? If you are, thank you for your dedication. All of these places are vital in holding back the disregard for humanity that we see all around us but, I would like you to consider breaching the dam. What is this dam? The dam is the reluctance of discussing abortion and its consequences with our younger generation in an honest nonthreatening forum long before (this is so critical) a crisis pregnancy arises. It is the common held viewpoint of not discussing facts, being informed of the resources available, or making life decisions about a crisis pregnancy until you are in one. It is the place that those who practice abortion try to protect most because they know this is the place young adults would be the most vulnerable. How do you get to the dam? Are you in a classroom where you have an opportunity to influence young minds to engage in the Pro-life debate? If you are, make cracks in the dam!! By using my first “Write For Life” series novel, you now have a greater opportunity to approach and break through the silence. Viable@140 is an interesting, creative, and novel approach in breaching the taboo of discussion about abortion. Have you observed how much young adults are immersed in the fictitious characters in Star Wars, Harry Potter, and the Hunger Games. Why not meet them there with a suspenseful, intriguing, fictitious novel that will encourage conversation about Pro-life and the humanity of the preborn? Imagine entering a classroom where teenagers and young adults are discussing abortion, adoption, ultrasounds, motherhood, the roll of the father,dignity, love, betrayal, God’s grace and timing. You are able to discuss all of these themes with heartfelt passion and in a Christlike manner, all before a crisis situation occurs. The enemy would prefer to continue to keep this subject matter taboo and locked into the fortified structure of the dam so mothers and fathers in crisis can continue to be victimized and without the support from others whom they can trust to understand their fears. Let’s be like Force 10 and detonate this dam. VIABLE@140 can bring the true picture of tragic choices to the minds of the younger generation and be a conversation starter in anyone’s ministry that celebrates life. Once the power of well informed minds of our youth are released there will be no stopping them from making a destructive impact against the fortified and entrenched forces that encourage and profit from abortion. Please share this post and download a free copy of VIABLE@140 so others may use this ministry to fan the flames for our passion for life.